Once the king of the luxury-sedan universe, the Mercedes-Benz S-Class has faced a growing number of competitors over the past decade or so. Just this year, Maserati unleashed its beautiful new Quattroporte 4-door luxury sedan, and up-and-comers like Lexus, Infiniti and even Hyundai, as well as Bentley and perennial competitor BMW, have encroached on S-Class territory, making it more difficult for the German automaker's flagship sedan to distinguish itself to discerning buyers. So for the latest sixth-generation S-Class, which debuts for 2014, Mercedes pulls out all the stops, presenting a powerful and angular sedan with all the bells and whistles you could possibly imagine and then some. Will it be enough to ensure the S-Class's position as king of the road? Only time will tell, but Mercedes is leaving no stone unturned in its efforts to ensure the S-Class remains at the top of its class. The list of new features for the 2014 S-Class, including a number of cutting-edge options, runs nearly as long as the vehicle itself, and upgrades are found in every area of the vehicle, from the chassis, suspension and front grille to the lighting, safety, audio and climate control systems. Particular attention was paid to raising the comfort level for rear-seat passengers, and new available features like Road Surface Scan and Magic Body Control are designed to make road imperfections virtually disappear, resulting in one of the smoothest rides available today. It all starts outside, where the S-Class's hood looks a little longer and the cabin sits a little further back on the body, resulting in a more athletic profile. That continues up front, highlighted by the angular design of the fascia and a larger, more vertical front grille, which received the 3-dimensional treatment. Mercedes says the S-Class displays Dropping Sideline styling, seen along its sculpted sides, which draws on cues from the previous generation. The automaker also sought to improve the S-Class's overall balance, with a near-perfect 52 percent of the vehicle's weight concentrated in the front end. Pronounced shoulders at the rear wheels and a gently sloping rear end complete the look. New for 2014, Mercedes uses only LED lights for all the vehicle's lighting systems, including the headlights, taillights and all interior lights. Nice features like dimming brakelights, which reduce their brilliance at night out of courtesy to other drivers, move the innovation bar forward. The automaker also made improvements to the S-Class's optional Adaptive Highbeam Assist Plus and Night View Assist Plus, which improve driver visibility at night. 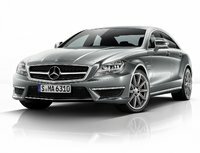 For 2014, Mercedes offers the new S-Class in S550 and S550 4Matic trims, as well as in a performance-oriented S63 AMG version. All U.S. trims come only on the long wheelbase platform, which measures 124.6 inches, the same as the previous generation. Width grows about an inch, from 73.7 inches for the previous generation to 74.8 inches for 2014, while overall length remains the same at 206.5 inches. Weight also remains similar, at 4,729 pounds compared to 4,740 for the previous generation, thanks in part to a third-generation aluminum hybrid bodyshell, which helps keep the weight down. Mercedes offers the S-Class with either rear-wheel drive or the automaker's 4Matic all-wheel-drive (AWD) system. Power for the S550 and S550 4Matic trims comes from a 4.6-liter twin-turbocharged V8 engine, which delivers 449 hp and 516 lb-ft of torque at 1,800 to 3,500 rpm. Despite the fact that horsepower for the new V8 jumps by 20 over the previous generation's, fuel economy improves, from 15 mpg city/25 highway for the previous generation to 17/26 for the new V8, thanks to a number of engine upgrades like high-pressure direct injection and rapid-multispark ignition, as well as reduced friction, some on-demand components and an Eco start/stop system, which shuts off the engine while idling. The new V8 links to a 7-speed automatic transmission with paddle shifters for manual shifting. The V8 drives the S550 from 0-60 in 4.8 seconds. The S63 AMG upgrades to a 5.5-liter twin-turbo V8, which pumps out 577 hp, an increase of 49 hp over the previous version, and 664 lb-ft of torque. With all that power, the S63 makes the leap to 60 mph in just 3.9 seconds and has a top speed of 186 mph. The bigger V8 also includes an Eco start/stop feature, and mates to an AMG SpeedShift 7-speed sports transmission with C (Controlled Efficiency), S (Sport) and M (Manual) driver-selectable modes. In the S and M modes, the Eco feature is disabled for a sportier driving experience. Mercedes also equips the S63 AMG with its 4Matic AWD system for the first time, as well as a weight-saving lithium-ion battery, which replaces the typical battery. Although the new V8 delivers more power than its predecessor, it manages better fuel economy numbers, Mercedes says, although it has not yet released specific numbers. Both S-Class engines require premium fuel. All S-Class trims ride on an AirMatic semi-active suspension with Comfort and Sport modes, although it's sport-tuned for the S63 AMG. The suspension features electronically controlled air springs, which automatically adjust to road conditions as well as to additional passengers or cargo inside the vehicle. In addition, the system lowers the car's ride height at higher speeds to improve aerodynamics, fuel efficiency and overall stability. A torque vectoring braking system, which automatically applies the brake to the inside wheel on tight curves to prevent understeer, also comes standard on all trims. The S63 AMG gets high-performance ceramic brakes for the first time. 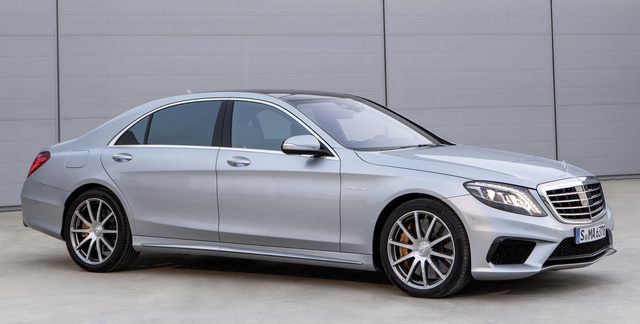 All trims get electromechanical power rack-and-pinion steering, although it's sport-tuned by AMG for the S63. The S550 and S550 4Matic ride on 18-inch alloy wheels, while the S63 AMG gets 19-inch AMG light-alloy wheels. Among the new S-Class innovations for 2014, one of the highlights is a new optional suspension system called Magic Body Control. It uses a camera and sensor technology called Road Surface Scan to scan the road ahead, looking for bumps and imperfections. When it detects rough roads, the system automatically makes adjustments to the suspension and wheels before they reach rough spots to ensure an optimal smooth ride. Inside, Mercedes made an effort to improve rear-seat comfort, since the automaker notes the S-Class is often used as a chauffeur-driven vehicle in many parts of the world. Owners can opt for an Executive rear right seat, which power-reclines up to 43 degrees and includes both a power calf rest and a power footrest. The rear-seat passenger can also use controls to move the front passenger seat forward by 3 inches and tilt the front seatback forward to expand legroom and roominess. As expected, the 2014 S-Class comes equipped with all the expected upscale amenities, including double-stitched leather upholstery, heated 16-way power-adjustable front seats, multizone LED lighting, Burl Walnut trim and a wood-and-leather multifunction steering wheel. The upgraded instrument cluster and controls include analog-style gauges, along with dual 12.3-inch high-resolution screens, which display navigation and audio details, as well as a variety of configurable information. An 80GB hard-drive navigation system also comes standard. The 13-speaker 590-watt Burmester audio system includes HD radio, a 6-CD/DVD player, a 10GB music register, satellite radio, dual USB ports and an in-car WiFi hotspot system. A panorama roof, dual-zone climate control and illuminated entry are among the other standard features. New interior options for 2014 include a cabin fragrance system with 4 aromas. Other options include heated and ventilated rear seats, a rear entertainment system and power rear window blinds. For 2014, Mercedes upgraded a number of S-Class safety features, such as the Pre-Safe system, which prepares the vehicle in the event of an impending accident. In addition, a PreSafe Brake system detects pedestrians ahead and initiates braking to prevent an accident. Other standard safety features include a Collision Prevention Assist system, which works with the braking and PreSafe system to help drivers avoid collisions. Optional safety features include an upgraded Night View Assist Plus and an Active Blind Spot Assist with Cross-Traffic Assist. What's your take on the 2014 Mercedes-Benz S-Class? Users ranked 2014 Mercedes-Benz S-Class against other cars which they drove/owned. Each ranking was based on 9 categories. Here is the summary of top rankings. 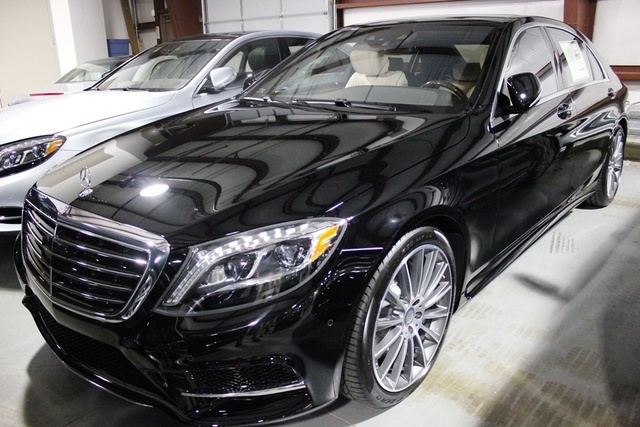 Have you driven a 2014 Mercedes-Benz S-Class? When I turn the wheel on my merc s-class 2014 I get a faint buzz like squeak. Is this low power steering fluid?? ?